On March 5, 2014, the day after Long Beach homicide detectives conducted a shoddy search, Dana’s family visited the house. Huck showed them the recreation room where he claimed the “accident” had happened. He enacted how it might have occurred. Looking at the room, and considering Huck’s description of events, it was immediately clear to the family that his story strained credulity. Wooden cabinet and the location of Dana’s head when paramedics arrived. For example, Huck claimed that Dana had hit her head on a wooden cabinet and was knocked unconscious. And yet, somehow her head had landed on the floor several feet away from the cabinet — at a spot that Huck had marked with a white, ceramic candle holder. Huck claimed that he had heard a loud crash, “like wood being hit.” Therefore, he knew that Dana’s head must have hit the cabinet, he said. On the night of March 5, after everyone else had left the room, Dana’s father struck the wooden cabinet with his hand as hard as he could, and no one noticed the sound. More than one dozen dumbbells were clearly visible in the recreation room. The family could not help but notice that the hexagonal edges of the dumbbells matched what they had been told by hospital staff about Dana’s scalp laceration. The laceration was deep, and shaped like an upside-down or backward letter “L.” The family immediately suspected that the wound had been made by one of the dumbbells. Dana’s sister saw what appeared to be dried fluid on the edge of one dumbbell. She recorded a short video of it. Video clip shows fluid mark on a dumbbell on March 5, 2014. On March 10, 2014, after the Dana’s vital organs had been harvested for transplant, her sister contacted the LBPD to inquire about the status of the investigation. At the front window at police headquarters, she was told that the LBPD had no record of any calls to Dana and Huck’s address. She left a message for someone from homicide to call her. Later that day, Homicide Detective Todd Johnson called Dana’s sister and explained that the home-surveillance video corroborated Huck’s story, and there would be no further investigation. Dana’s sister argued with the detective, claiming that he had ignored evidence, such as the dumbbells. The detective dismissed her concerns. On March 11, 2014, Dana’s sister filed a complaint (pdf) about Detective Johnson with the Long Beach Citizen Police Complaint Commission (CPCC.) In her complaint, she specifically cited the dumbbells as likely bludgeons that had been ignored by the detective. 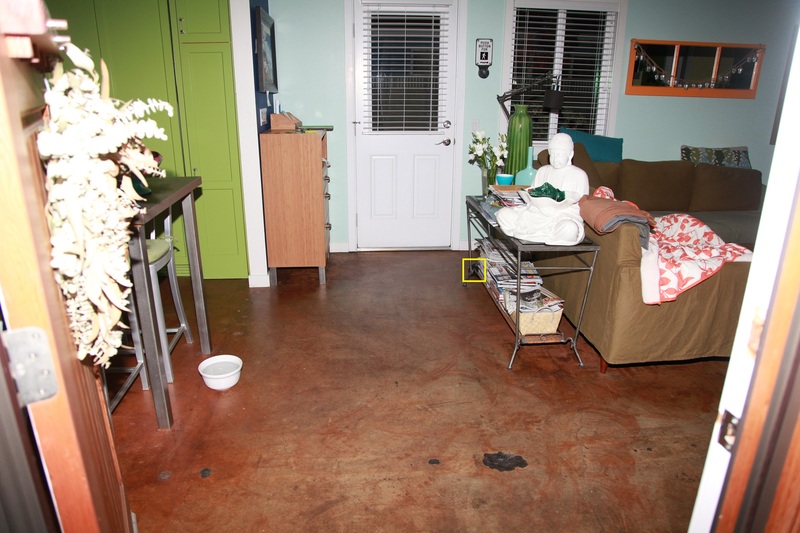 This suggests that, after the autopsy, the medical examiner and the detectives were not satisfied that the concrete floor had caused the “kind of injury” that Dana had sustained. Scientific Services (pdf) reportedly tested for blood in the room, but collected no evidence items. The detectives, unable to find any “item” in the workout room — despite the presence of at least 16 dumbbells that can be seen in police photos — apparently abandoned their search for evidence. 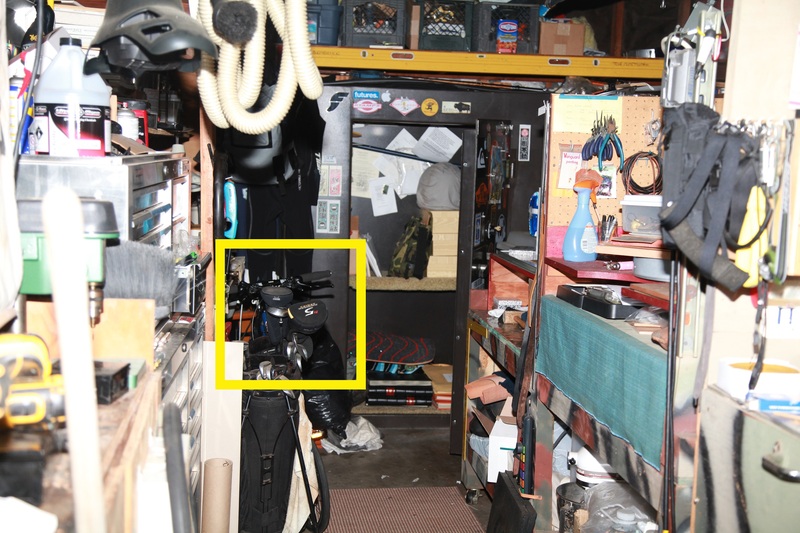 Golf clubs in the garage can be seen in a police photo. Huck’s garage was full of “items,” too, including golf clubs and construction tools. 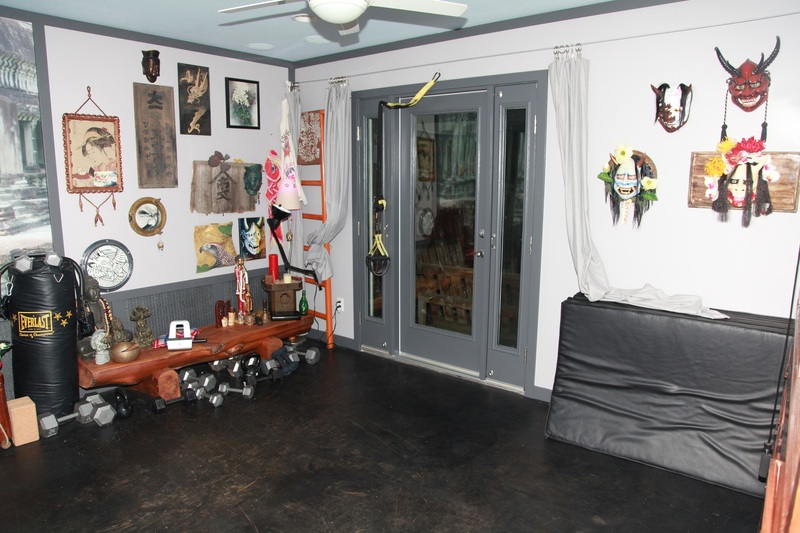 Why did the detectives assume that, several days after the incident, any “item” used as a bludgeon would be in the yoga room, and only in the yoga room? 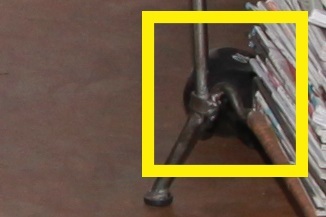 A dumbbell can be seen near the kitchen hutch in a police photo. 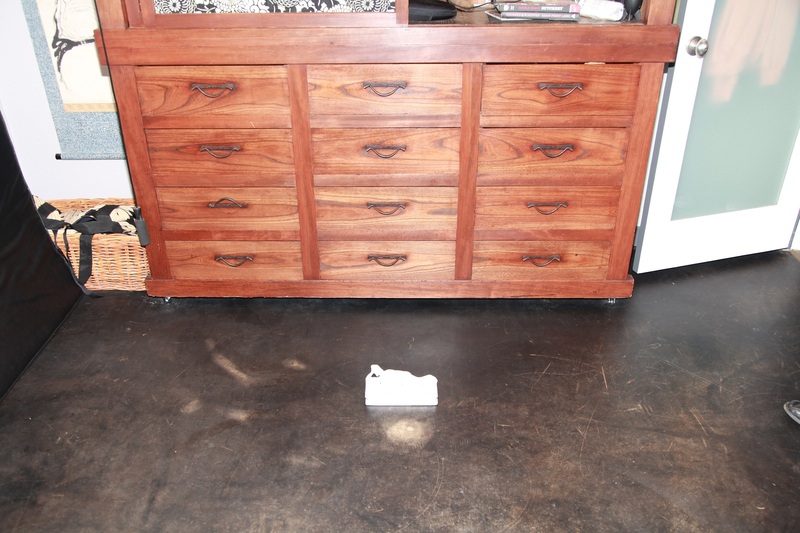 If the detectives had searched the house looking for additional “items” to test for blood, they might have found the dumbbell that can be seen on the floor across from the kitchen hutch in LBPD photo img_00028. It seemed to Dana’s family that the detectives were more interested in ignoring evidence than acknowledging it. Detail from LBPD photo img_00028 shows a dumbbell.